We're celebrating the new year with brand new FREE SN@P printables! We know many of our customers love our SN@P cards and accessories that make it so easy to share your story...and many of you may be planning your 2013 albums using our fabulous SN@P! products...so what better way to start your album and the new year than with these fun new 4x6 and 3x4 printables! We have 14 FREE SN@P printable cards just for you - 5 4x6 cards and 9 3x4 cards! 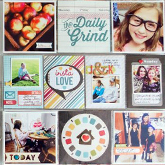 Simply print, trim and insert into divided pocket pages for quick and easy scrapbooking. And in case you're wondering we've been working on some amazing new products just for you that we can't wait to share....we'll be starting our new product reveals on January 2, 2013 and you don't want to miss this...we have a FULL WEEK of new reveals and giveaways...so get ready! These are awesome, thank you so much. Hopefully you guys will sell digital files in the future!!! am i missing something? How do I download the printables? Thanks for the printables! Love them!!! I hate my new computer, I cant get any of your wonderful downloads to load :(. Thanks so much; love Simple Stories! Where do I go to get the snap printables? Happy New Year! Thank you! Can't wait for the new sneaks, I have been saving my pennies for your new lines and Echo Parks! never mind, got it! Thank you so much!! Thank you for your excitement! You can click on the card images or we just added another link under "Download Free SN@P Printables - hopefully this works for everyone now! Oooh, thank you so much! From a sn@p lover in Scotland! These are wonderful. Thank you! Thank you so much. My favorite is the brand new year card. Happy new year! Thank you so much!!!! love them. Happy New Year to all....LoVe Simple Stories!!!! Thank you !! I love Sn@p !! Happy New Year ! These will work on so much more than just sn@ppers ! Thanks so much...this is awesome! These are fun! Thank you! Thank you so much. I wish Simple Stories would go "digital". I love SS, SN@P, etc. and use it traditionally, but I'm primarily a digital scrapper and would love to see everything in digital format. LOVE the printables! Thanks... They are making their way to my PL cover page. thanks so much !! love them !! Thank You! Love the colors! I clicked on the link and it says page not found. Help! I really like these and want to download them. Thanks so much. This is awesome. I have now become a huge fan of Simple Stories, so its nice to get freebies once in awhile. Happy New Year! Thank you so much for sharing the cuteness! Thank you - love it! Tried 4 times to download. Message comes up stating that the download is now damaged and can't be repaired. Therefore, Im not able to download your awesome free 2013 printables. Please advise. Thanks for the printables! They are adorable and just my style!!!!! Happy New Year! This is awesome. I've been shopping today for the materials for my 2013 album. I'm going to take a stab at a weekly/annual album for the first time and love your smaller format. Thanks for the help kicking things off while I'm waiting for my supplies! Thanks...Love the printables...Love all your stuff..This week I am finishing 4 albums all made with "Take a Hike"! Just what I needed to start off my album! Thanks and please make more during the year. Thank You!!! I love the Simple Stories line and SN@P is one of my favorites... I printed these Free ones out and can not wait to scrap with them.. Looking forward to 2013 and all your new ideas. Thank you these are terrific! Thank you so much. I have new Sn@p binders waiting for me to start the new year! Looking forward to lots of memory keeping with this system. How are you today?I like your blog for a long time!I think that is a good blog,i hope to see more about yours!thank you! It says the file is broken and cannot be fixed. These are wonderful! Snap is my favorite line for Project Life. Love, love, love it! Thank you so much! Thank you so much. These are lovely and great colors. Happy New Year! Thanks for the sweet surprise! I love these printables. I printed them on craft paper and they look AWESOME! thanks for the 6x6 pad of paper this will come in handy for card makers. They look great, but I still can't download them. Any help would be appreciated. What a generous gift for us! Thanks so, so much! I love them!!!! Thank you so much. I just started my first Project of Life and these free printables are beautifull! If anyone is having trouble getting the file, I did too - but I switched browsers and it loaded. Maybe try another browser. Thanks so much Simple Stories! oh, these are gorgeous! can't wait to see the new line up! so pretty, thanks so much! L O V E - Thanks so much! Pure awesomeness!! Thanks a bunch! Thank you Thank you Thank you!!!! This sooo amazing!!!! Simple Stories and SN@P ROCK!!!!! Unfortunately my computer still won't download these cards. Any other ideas to enable me to download them. I love using Sn@p collections and would love to add them. Am I missing something? I click the download link and it just sits on the loading screen. :( Anyone else having problems? Addicted to Simple Stories!!! Thanks for the great printables! Thank you! I recently discovered Simple Stories line at the store and am having fun with it! These are amazing--I love them and would LOVE to put them on my title page. The only problem? I am digital! Any chance you could provide the .png download file?